Sebastian Vettel says he has moved on from the first-lap Singapore Grand Prix crash that left the Ferrari driver 28 points behind Lewis Hamilton in the Formula One championship battle. "I don't think there's much assessment necessary," said the four-time world champion, sitting between teammate Kimi Raikkonen and Red Bull's Max Verstappen at a news conference ahead of Sunday's race. "Obviously, on Sunday all three of us were unhappy but you move on. "I think we have a lot of races left, I think we have a strong car. I'm not too fussed about the amount of points," he added. The Briton won't need to win another race this season if Vettel, a record four-time winner in Malaysia, finishes lower than second on Sunday. Hamilton, who suffered a similar championship setback to Vettel a year ago in Malaysia when his engine blew while he was leading, was also reluctant to hail the Singapore race as the season's decisive turning point. "There's lots of turning points within a year," he told reporters. "I'm going to try and make sure that was the last one." 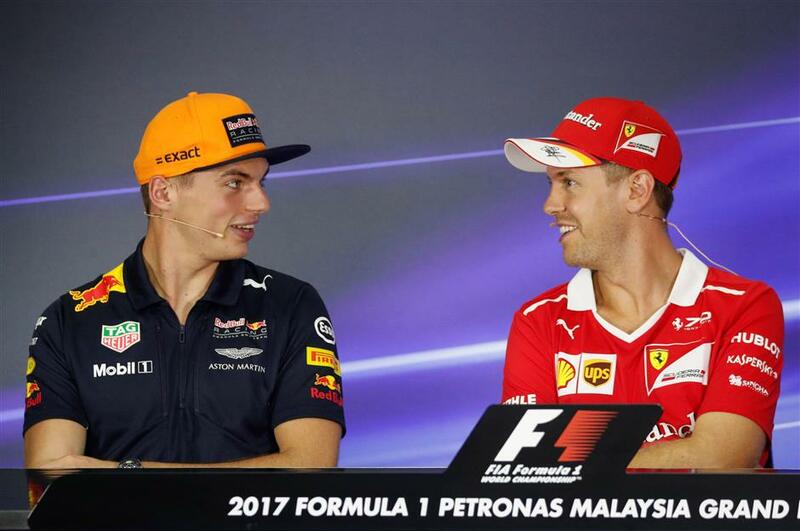 Red Bull's Max Verstappen (left) and Ferrari's Sebastian Vettel speak during news conference ahead of the Formula One Malaysian Grand Prix at the Sepang circuit outside Kuala Lumpur on September 28, 2017.